The temperature in Arkansas just dropped. It's a bit deceptive, though, when the sun is shining so brightly outside. You step outside, and burrrr....I started to crave a little comfort food. Vietnamese comfort food. 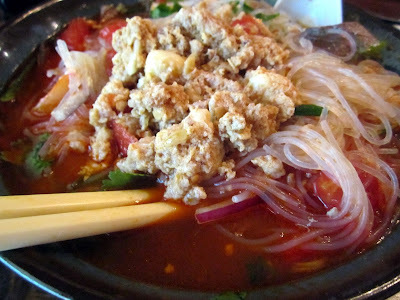 This is my favorite Vietnamese soup ever. It can be a long process where you start by putting the blue crabs in the freezer to let them fall asleep to humanely prepare them, or you can just use the lump crab meat from a can. When I was craving this soup, I did not want to wait long for it. I found a few helpers so that the process wouldn't be as long. 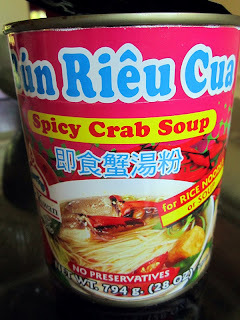 The rich crab flavor of the stock in this soup reminds me of a cioppino broth with an Asian flair. Using the pre-made soup is a big help when you don't have all day to cook. 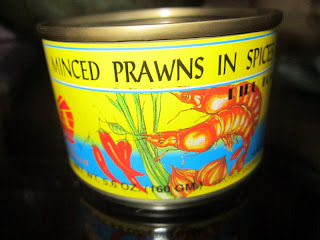 You can either use minced prawns in spices, or you can use minced crab in spices. 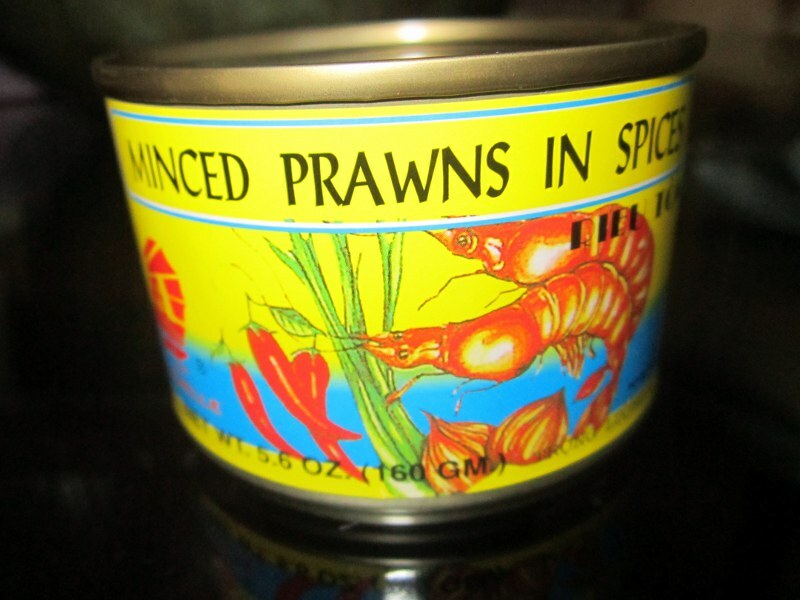 The spices in the can are the key flavor ingredient. They give the spicy crab soup the red color that is so distinctive. 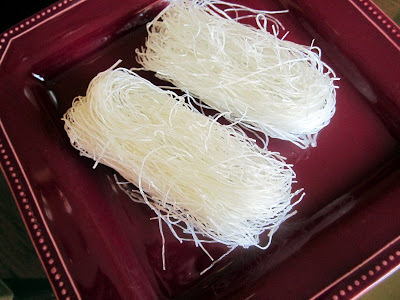 There are many different noodles used in Vietnamese cooking. I love the slippery consistency of dried bean threads when they're cooked. Because they are made of beans, these noodles have a low Glycemic Index, which is good for your body. Most Vietnames dishes are served with a big plate of herbs. 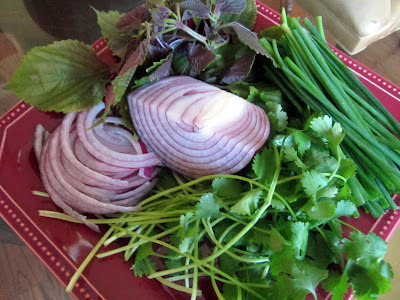 In this dish, I like chives, cilantro, red onions, and perilla. Perilla leaves are my favorite. They belong to both the mint family and the basil family, but their fragrant flavor surpasses any traditional mint or basil. Combine the pork, crab meat, eggs, and minced prawns. Heat the soup in the pan till it boils. Add spoonfulls of the meat mixture into the boiling soup. Lower the heat and let simmer lightly. When the pork and crab dumplings float to the top, they are done. After about 10 minutes, add the tomatoes. Boil the bean thread noodles, drain and rinse. Top the noodles with the soup, then add your herbs. 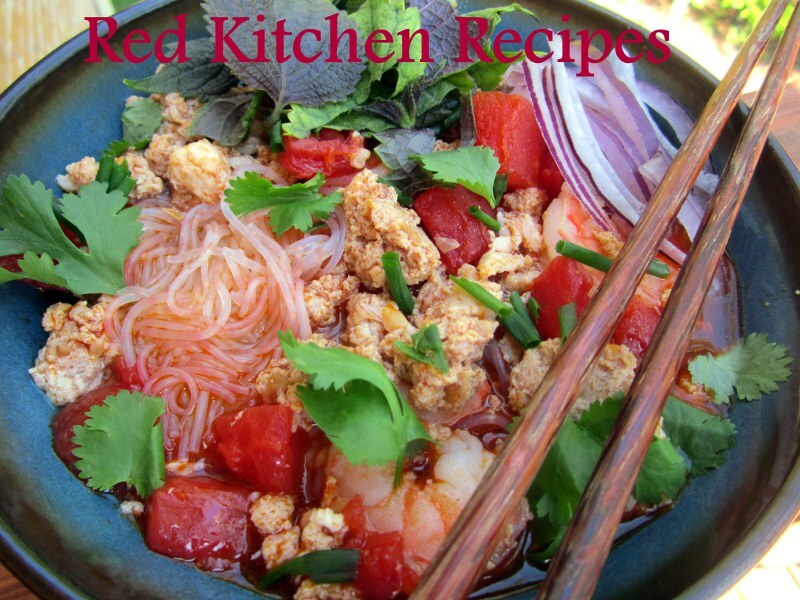 Flavor with fish sauce and shrimp sauce.